How did we find out about the Bus Party 2014? Partly by luck, partly by paying close attention to what was going on around us. 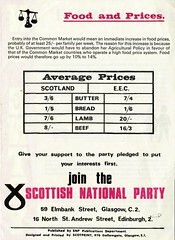 We’d been busy collecting referendum material for over a year and, as active collectors, we were always on the lookout for something distinctive to help to convey the tone and colour of the long campaign. 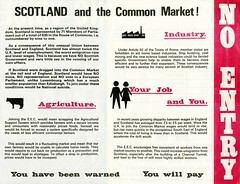 Lots of people sent us material, whilst our volunteers were also good at sending photos and items (see our referendum collection on Flickr here – https://www.flickr.com/photos/scottishpoliticalarchive/albums/72157630278967682. But, a lot of the time it was just the core SPA team capturing everything we could and that meant we collected everything we could get our hands on – leaflets, badges and every kind of campaign material (t-shirts, flags, mugs, key rings, etc.). We photographed billboards, events, stalls, meetings and any campaign activity we could find. It all went into the archive and lots went online too. It won’t sit around in boxes though, as we planned to work on a series of exhibitions on the referendum campaign once it was all over (hence the Bus Party 2014 exhibition). We were always clicking away on our camera phones and checking social media for events we could record and that’s where we found the Bus Party Listening Lugs tour – forgetting the fact that I’d read about the 1997 version in Neal Ascherson’s book Stone Voices way back in 2002 (which was republished in 2014). 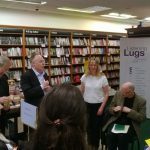 We caught two of their events in quick succession – in the Waterstones bookshop in Falkirk’s High Street on 29th May 2014 and at the Church of the Holy Rude in Stirling on 31st May. 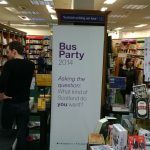 At each venue, we had an essential Bus Party event – with an introduction by Will Storrar and readings and music from the Bus Party participants. 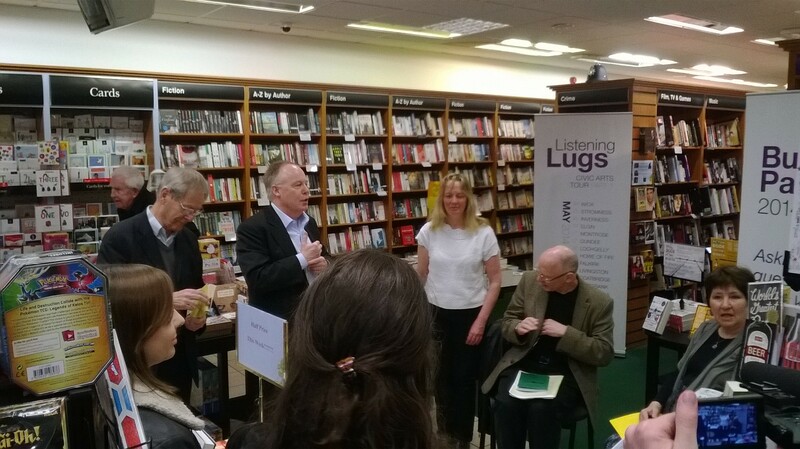 At Falkirk, there were readings from James Robertson, Janet Paisley and Neal Ascherson. 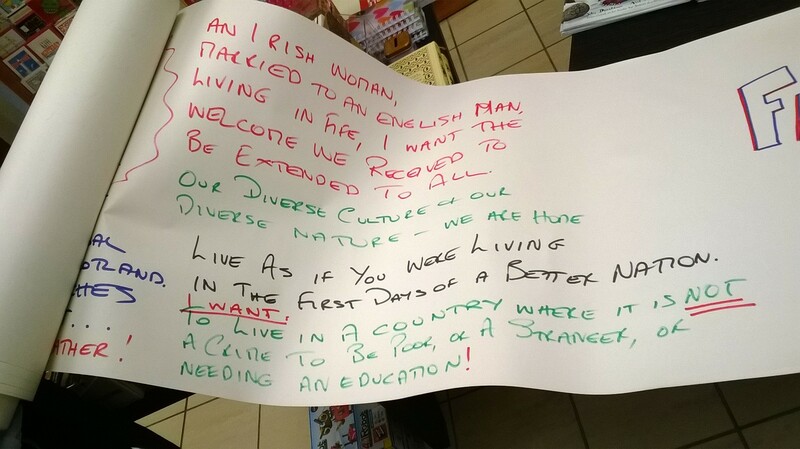 There was also music outside by the Lazyboys of Banknock. 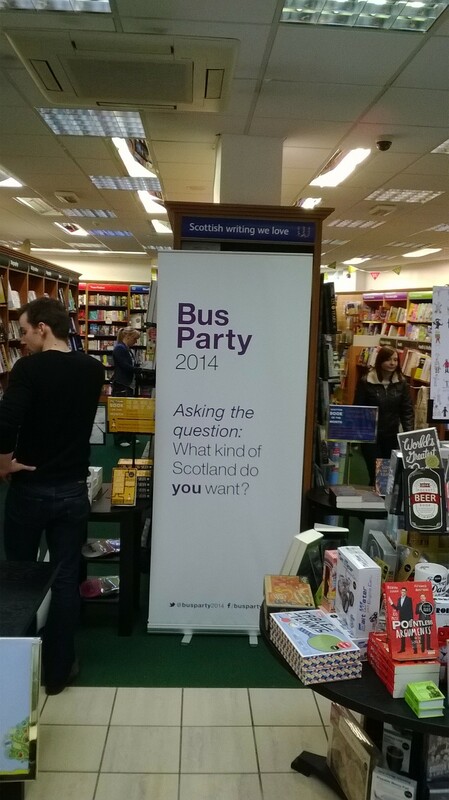 At Stirling, the Bus Party featured David Greig, Billy Kay and James Robertson. On both occasions, there would be performances followed by discussion and also, by people contributing to the scroll – a huge roll of wallpaper bought at B&Q in Wick. 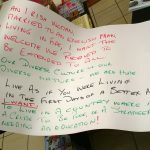 As the Bus Party travelled around Scotland, the scroll filled up with people’s thoughts about the kind of Scotland they wanted to live in. 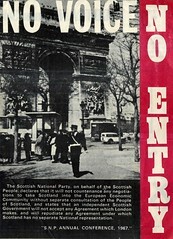 And, in time, SPA became the fortunate recipient of the scroll and a number of photos from the Bus Party events – for careful archiving as well as use in any future exhibition.